This is the first in a series of three mystery photographs submitted by Ted Talbot. The photograph by H. Gordon Tidey is of a Claughton somewhere on the the North Wales coast line. The date is believed to be the autumn of 1920, as another photo by Tidey of the same engine, no. 32, has a pencilled note on the back 'New Claughton'. No. 32 was new in August 1920. Where exactly is it? What is the train? What are the details of the stock? Yes, the North Wales Coast Line, somewhere between Mold Junction and Prestatyn. The train is on the Down Slow line. Pretty certain about this one, up slow beneath shoulder of Bryn Euryn Hill mid way twixt Mochre & Pabo and Colwyn Bay! Yes, I thought of Bryn Eurin as well but was put off by the "flatness" of the backgound, the area obscured by the steam. I ought to know that location though, I was born in the Astoria Nursing Home in Llanerch Road West, at 7.55am on a Wednesday morning. I claim that the first sound I heard was the Up Manchester Club Train and that was my introduction to Railways! The other location I had in mind, was around Holywell Junction. If we knew the time of day of the shot, that could help. To keep the matter in my mind, I have set the picture as my wallpaper just now! After looking at that for a couple of days, I too feel that is the more likely location. Well spotted Tony! 1. Gordon Tidey has taken many pictures around this area. 2. The track in the lower left of the picture is beginning to bend left just by the road (to the gas works and cemetry) that passes underneath the railway. 3. The train is about to pass underneath the main road from Colwyn Bay to Llandudno. GT usually takes his photographs after this bridge, NOT before as in this case. 4. As the train is almost facing east (north being by the wood) then the picture must have been taken around mid-morning by the small amount of reflection off the Belpaire firebox. 5. The 'sharp' end of the upper wall just above the first carriage is still in-situ. I have taken photographs as confirmation of the above. My original thinking was this photograph was taken around Mostyn, because of the hill in the background. It was only obvious to me, after the site visit, that the smoke from the locomotive covered the fact that there were two hills not one, which led me to my original thoughts. So all we need now is which train is it? Did you say Manchester? The BCK bringing up the rear is D213, a narrow (8ft 6in) high roof carriage. You can see clearly on the photo that the first carriage in the set (like the first in the train) is a cove roof Brake, and the last one looks narrow. The BFK should be at the London end, so this would then indeed be an Up train: in fact the 7.55am Llandudno-Exchange. The two arc roof carriages in front of the set are probably strengtheners, but the three leading carriages are more curious. According to the passenger timetable this train originated in Bangor, but it seems unlikely that these three carriages were from Bangor, unless for some reason the trailing Brake had been detached at Holyhead. Thanks John for checking out the location. As to the train my guess is the Up Welshman hauled by a 7A Claughton right through to Euston. It left Llandudno Junction at 11.55am having joined the Pwhelli/Portmadoc portion with the Llandudno portion which had the dining car, see next to Brake half way down the train. 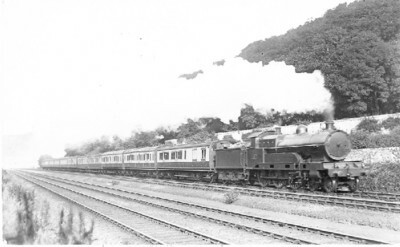 By the summer of 1923 the Down working of this train had the longest non stop run on the system - Euston to Prestatyn! Must have been sweeping the tender out by the time they got back to the Junction!